As you may know, I recently transformed part of my front porch into a cozy outdoor living space. 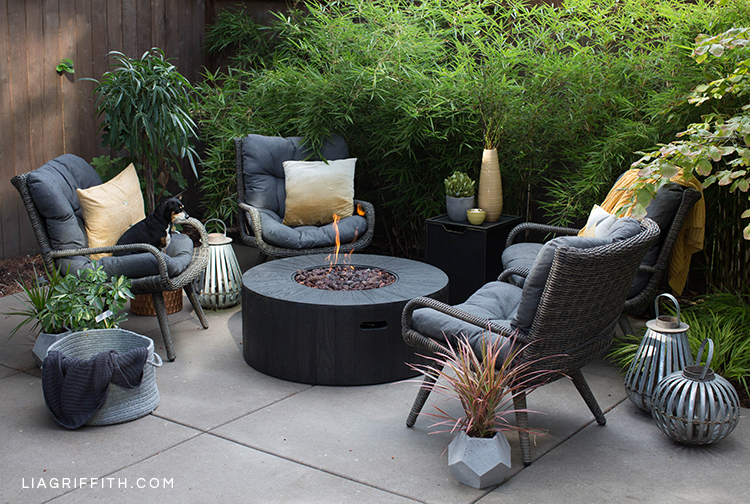 Thanks to my friends at Hayneedle, I was able to create another comfy outdoor area—but this time in my backyard! 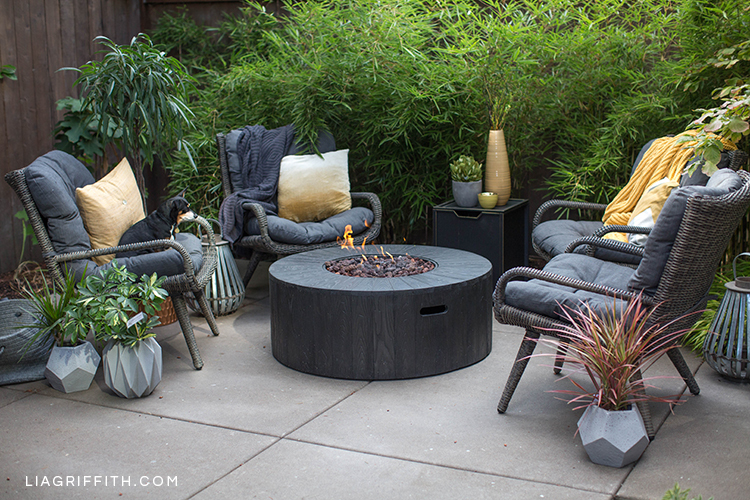 All it took was this outdoor fire pit from Hayneedle, some soft pillows and blankets, and a few plants, of course. There are so many ways to create an inviting outdoor space that’s perfect for both relaxing and entertaining. 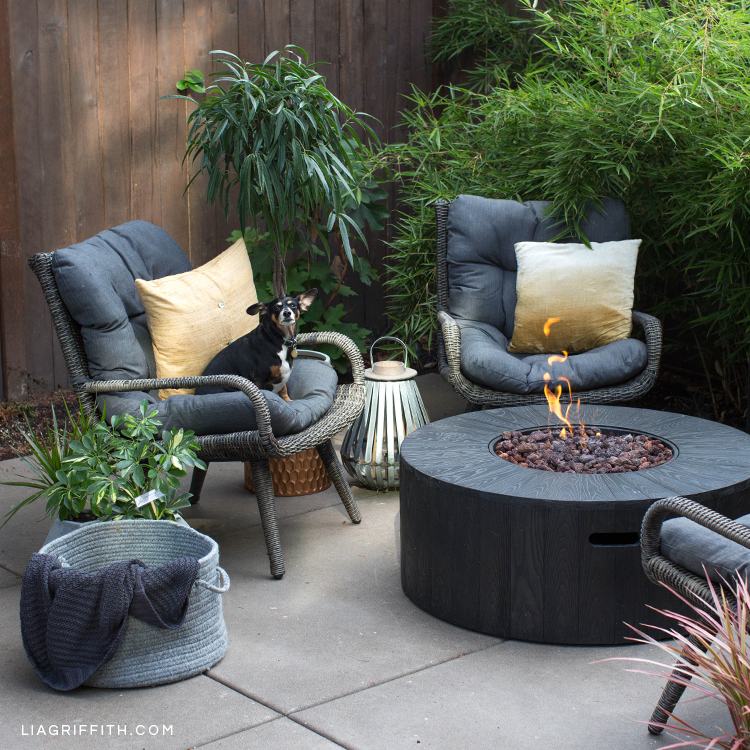 I personally love to lounge out here with my dog, Enzo, or enjoy the fire pit with friends. Funny story. When I went to photograph this set for you, I turned on the fire and Enzo immediately hopped up on the chair and made himself at home. He seemed mesmerized by the flames. It was pretty fun to watch! If you’re searching for outdoor ideas, here’s a look into my thought process for this space. Let me know what you think! 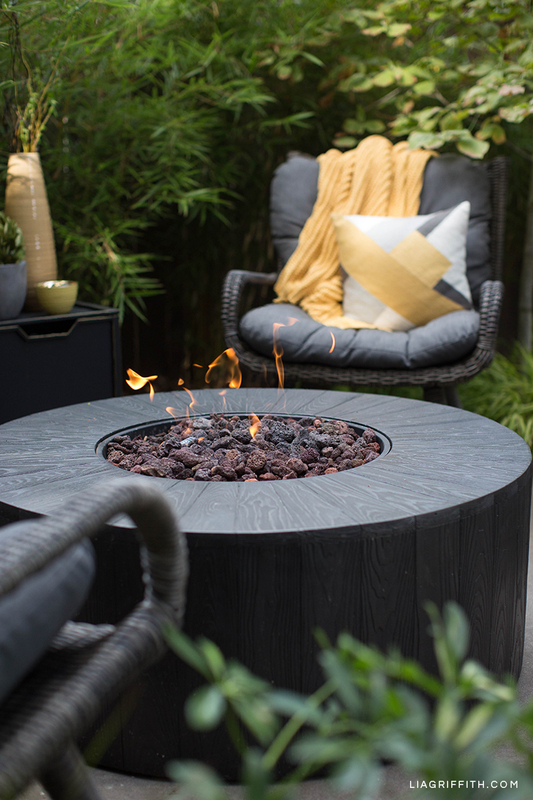 This outdoor fire pit from Hayneedle is actually part of a set. It comes with two wicker chairs and an end table. If you’re curious, the other chairs you see here are from our porch conversation set. These wicker chairs make great outdoor seating because they’re weather-resistant and durable. Yet they’re also lightweight and therefore easy to move around. The plush cushions make these chairs very comfy to sit on, too. As far as the gas fire pit goes, I like that it’s really easy to use. You just have to push a button to start it and turn the knob to control the gas flow. Plus, you get all the warmth without the smoke. Another nice thing is that the ring around the fire pit stays cool. So you can use it as a table top and put your food and drinks on it without them getting too warm. To add more warmth to the space, I brought in the saffron color you see here in the pillows, blankets, and decor. 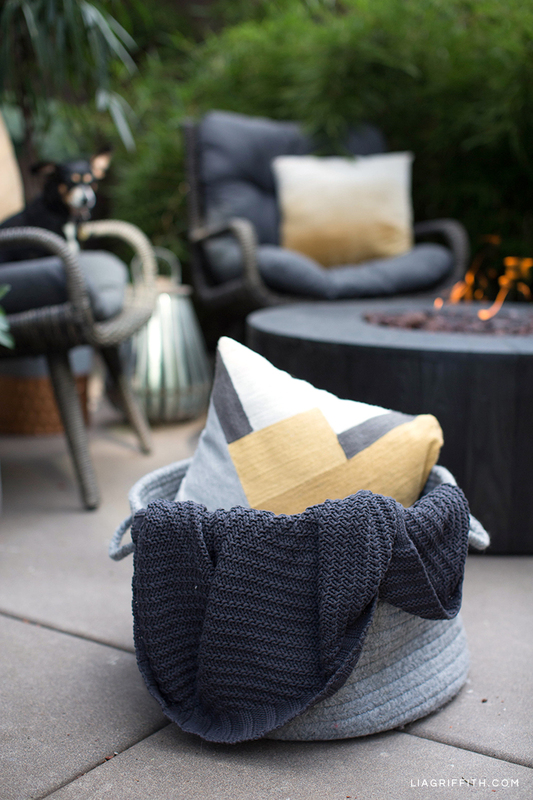 This color also complements the charcoal grey colors of the fire pit and the chair cushions. Saffron is definitely a trendy fall color. And it happens to be one of my favorite colors to add to fall decor. The urban jungle trend is also big right now, which is what we were going for with this outdoor space. There are a lot of lush plants surrounding the seats and fire pit. You can find the geometric plants listed here, which are also from Hayneedle. In addition to real plants, you could add some paper plants for extra greenery. We also created a fun styleboard on Hayneedle. Have you been wanting to create a space like this in your own backyard? 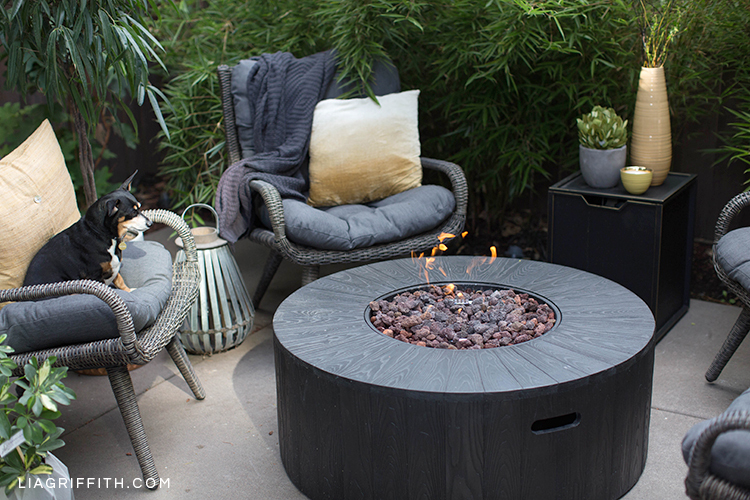 If you have any questions about this outdoor fire pit from Hayneedle, or my style choices for this outdoor space, just ask! Want more home decorating tips? We’ve got plenty of outdoor living ideas as well as home decor ideas for you to explore. You can also find new projects on our social pages. So make sure to follow us! We’re on Instagram, Pinterest, Facebook, Twitter, and YouTube. Also, we encourage you to share your home decorating ideas and tips with us and the rest of our crafting community, too! 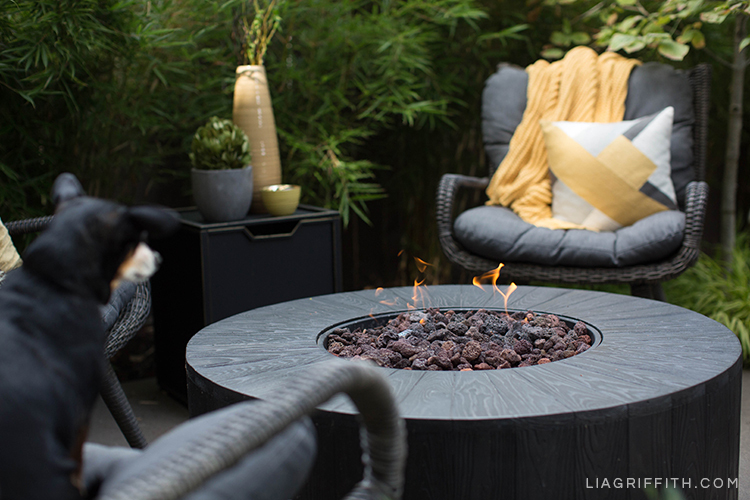 If you’ve just redecorated or restyled an indoor our outdoor living space, you can use the hashtag #MadeWithLia when you share your pictures on Instagram or Facebook.